Black t-shirt with long sleeves from Stichting Secret Garden. The Secret Garden Foundation is an Amsterdam based foundation by and for lgbt persons from ethnic and islamic background. 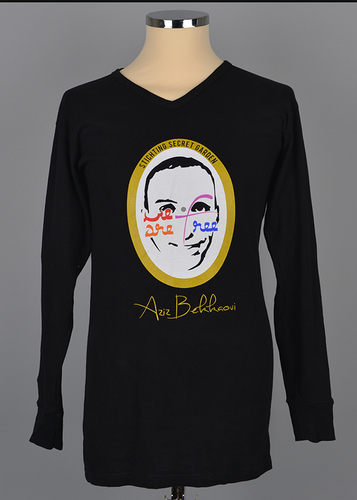 Black t-shirt with in pink the words "Jezelf kunnen zijn in Nieuw-West" meaning "Be yourself in New-West". Pink New-West is an Amsterdam initiative started from 2010 to discuss sexual diversity amongst mostly islamic migrants who live in the New-West area. 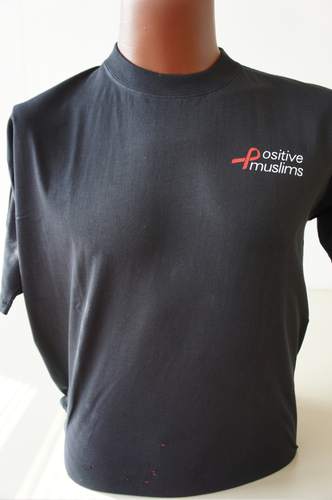 Back: "Positive Muslims. An Awareness raising & and support group for Muslims living with HIV/AIDS"
South African NGO committed to raising awareness about HIV/AIDS and offering support to Muslims living with the disease.